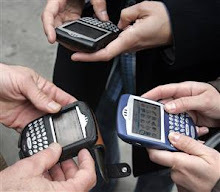 Blackberry Addicts: Even Huey's team having a change of heart? Even Huey's team having a change of heart? A campaign shocker was on hand with the revelation, shown at left, that the sweatermobile itself seemed to be changing allegiances. What about Probe's polling? Whew! What a ton of charts, graphs, margins of error, parsing of entrails. We loved hearing Probe supremo Scott McKay on CJOB radio saying the NDP is on a steep decline track -- since 2003! Wow, that decline may have legs by 2011. Anyway, the interesting thing is McKay doesn't compare his election numbers to his last public poll, showing team Huey and team Gary tied. There was no explanation why the NDP fortunes have consistently risen over most of the past year in his numbers. Hmmm. And as usual, the former Liberal Party pollster threw Jon Gerrard a lifeline with giving the doctor some 16% in the polls (guaranteed it won't be that high on Tuesday night) and "minor momentum" of 1% (what the heck is "momentum"? -- never saw that metric before). Anyway, apparently people's perception of Huey during the campaign has gone down -- a lot. The common wisdom after Tuesday will be that McFadyen blew it with the now-infamous Jets announcement. We believe it's actually the Tory advertising that's mainly to blame. Their "air war" campaign has been dominated by amateurish, even bizarre ad spots throughout the campaign (including the "revolving door" spot that has Hugh awkwardly throwing down a stack of newspaper headlines and the crazy ranting poor-man's Rick Mercer). After the election, the PC's in their truest tradition will start sharpening their knives for Hugh -- though he will likely survive that. But more usefully, they should turf their advertising firm. Regarding that ranting guy, who is he? Every local actor we have spoken to says they don't know who he is. Did the Tories have to resort to out of town talent? Hmmm. Maybe they kept him around to play chicken-man.